Welcome to the LeBlanc Lab! We create energy conversion technologies using advanced materials and manufacturing techniques. We are located at The George Washington University. With campuses in both Washington D.C. and Virginia's technology corridor, we are ideally positioned to link technology development with the policies and economics which shape its impact on society. We are looking for enthusiastic undergraduate and graduate researchers to join the group. Send us your CV or resume if you are interested. Our manuscript "Pulsed Laser Melting of Bismuth Telluride Thermoelectric Materials" was accepted to Journal of Manufacturing Processes. Congratulations to Michael Carter! Congratulations to Jim Tronolone for being selected to the National Science Foundation Graduate Research Fellowship Program! 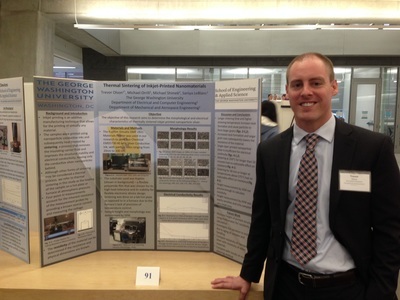 Jim has done outstanding undergraduate research in our group the past three years, and we are so proud of him. Jim will be joining the PhD program in the BME department at Texas A&M. We wish him the best of luck! Dr. LeBlanc will present in the symposium on Additive Manufacturing for Energy Applications at the TMS Annual Meeting next week. Contact her if you will be there. Dr. LeBlanc is a finalist for the DC area Women in Technology Leadership Award in Academia. Congratulations to Dr. Haidong Zhang on the publication of his paper, "Laser Additive Manufacturing of Powdered Bismuth Telluride." Dr. LeBlanc will present at the Solid Freeform Fabrication symposium. Let her know if you plan to attend, too. Dr. LeBlanc presented at the International Conference on Thermoelectrics. Dr. LeBlanc presented at the national ASEE conference. Check out the proceedings for her paper about the Nanotechnology Fellows Program's impacts. Welcome to the summer undergraduate research students! They are doing exciting projects on materials, manufacturing, and energy efficiency. Dr. LeBlanc was selected by the American Society of Engineering Education for its "20 Under 40 High-Achieving Researchers and Educators" recognition. Scientia published an overview of our research. Check it out here! Dr. LeBlanc will give an invited talk at the 3rd Additive Manufacturing Symposium hosted by NC State's Center for Additive Manufacturing and Logistics. Let her know if you plan to attend the symposium. Dr. Haidong Zhang's book chapter "Processing Parameter Effects in Laser Powder Bed Fusion of Ceramics" has been accepted for publication. Congratulations, Haidong! Congratulations to Michael Orrill, Jim Tronolone, and the 2017 Nanotechnology Fellows for their presentations at the SEAS R&D Showcase! Congratulations to PhD student Michael Orrill on his selection for the UNLEASH program in Denmark! Dr. LeBlanc presented the talk "Selective Laser Melting of Bismuth Telluride and Half-Heusler Thermoelectric Materials" at the 2017 Solid Freeform Fabrication Symposium. Dr. LeBlanc gave an invited talk at the 2017 International Conference on Thermoelectrics. Dr. LeBlanc won the School of Engineering and Applied Science Junior Teacher Award thanks to all the students and colleagues who help her create great teaching and learning opportunities! 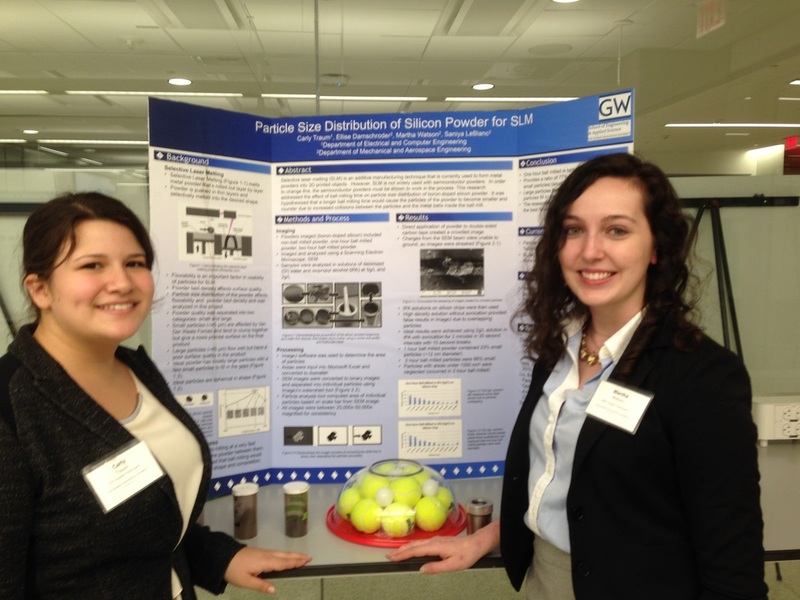 Congratulations to all the LeBlanc Lab students and Nanotechnology Fellows who presented research posters at the SEAS R&D Showcase and GW Research Days. The 2017 cohort of the Nanotechnology Fellows Program has been selected; congratulations to the new fellows! Congratulations to Dr. El-Desouky on his paper in J. of Manufacturing Processes! Dr. LeBlanc participated in the National Science Foundation's "Ask a Nano Expert" event. Check out her description about how to "see" nanomaterials, and find out what her nano superpower would be. Congratulations to Michael Orrill on his publication "Printed thermoelectric materials and devices" in J. of Applied Polymer Science! Congratulations to Dr. El-Desouky on being invited to submit a featured letter in Materials Letters! The article " Rapid processing and assembly of semiconductor thermoelectric materials for energy conversion devices" is now in press. 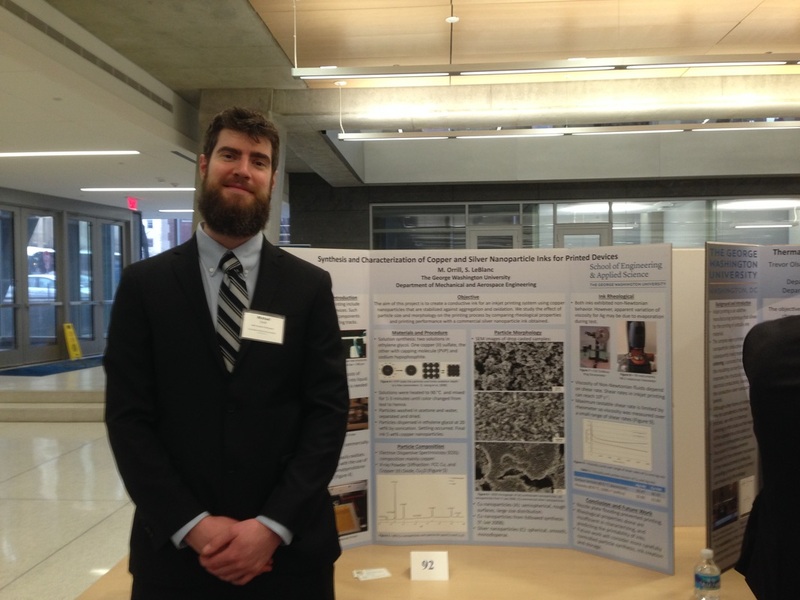 Congratulations to Michael Carter for completing his master's thesis, "Processing Bi2Te3 via Nanosecond Pulsed Laser - Numerical and Experimental Studies." Congratulations to the second cohort of Nanotechnology Fellows for completing the program and presenting excellent research project results! 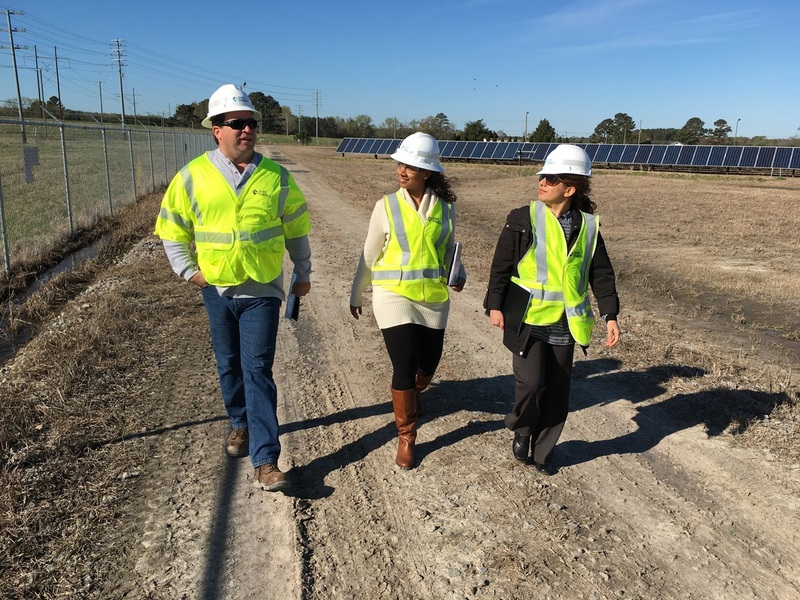 Prof. LeBlanc and students in her "Nanotechnology in Energy Applications" class visited Duke Energy Renewable's Pasquotank solar farm and remote monitoring center in North Carolina. The students will develop case studies investigating the technical, economic, and environmental impacts of the solar farm. Prof. LeBlanc is leading a project supported by The Duke Energy Renewables Innovation Fund. 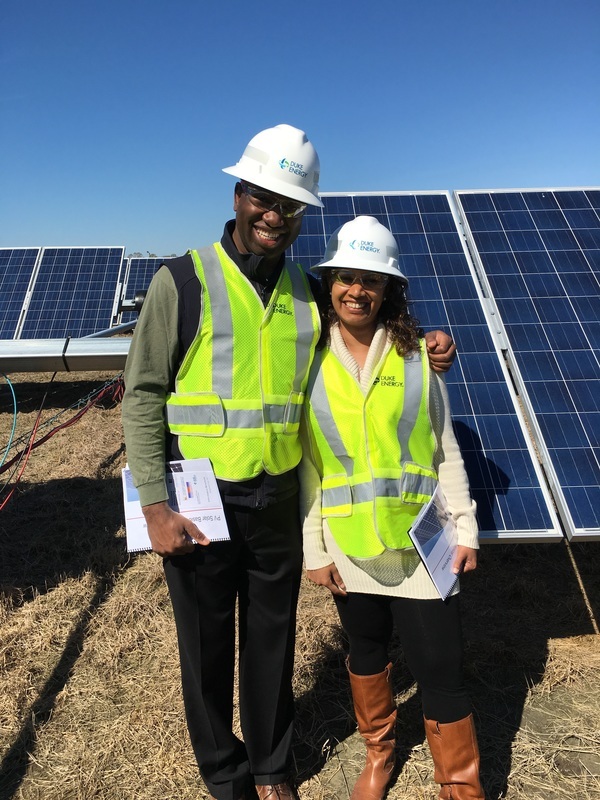 Read the GW Today article and watch the video to learn more about our "Living Lab to Study Solar Farms" project. Congratulations to Michael Orrill for passing his Doctoral Qualifying Exam! The LeBlanc Lab had a great showing at the R&D Showcase. Members Michael Orrill, Trevor Olson, Mattie Watson, and Lindsay Ryan presented posters describing their research. 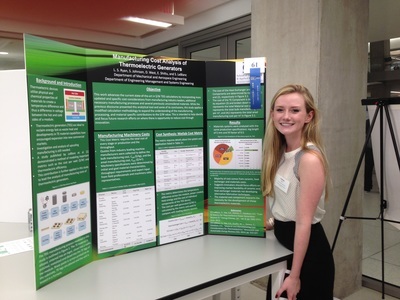 Congratulations to Lindsay Ryan for winning an honorable mention prize for Best Undergraduate Poster!